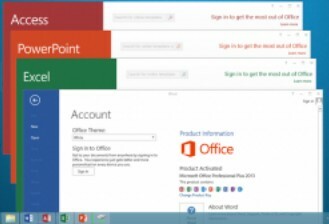 Top 10 New Features of Microsoft Office 2016. Microsoft drops a new version of Office every three years. But despite being one of the oldest, and the single-most dominant player in the market, Office today faces more competition than it has in the recent times. A number of emerging players including Google's Drive suite, and open source alternatives like OpenOffice and LibreOffice offer several of Office's features for no cost at all. So what new features has Microsoft added in Office 2016 to drive it miles apart from the rivals? Here are the top 10 features. Perhaps the single biggest addition to Office is the introduction of a feature called co-authoring in several of Office applications -- Word and PowerPoint. Co-authoring allows more than one user to work on a document simultaneously. Microsoft says that users can work on a document regardless of the device - read the operating system - they are using. Remember the annoying assistant Clippy that used to come in older versions of Office? Tell Me is a smarter version of it. Available in Word, PowerPoint, Excel, Outlook, Project, Visio, and Access, Tell Me is a smart assistant that can understand your queries written in completely human-y words. It will assist you with whatever issues you're having. There is also a feature called Delve, which as the company claims, uses algorithms to bring together the most relevant information or documents in one place. Forget the crippled built-in dictionary, Smart Lookup features in the new Office version will provide you with contextual information about words and phrases you need to know more about. When you select a word or a phrase - in Word, PowerPoint, or any other Office application - the sidebar opens at the right side with details about the selected text from various sources, including Wikipedia. Microsoft's Clutter feature in Outlook analyses your email pattern and also observes the people you interact with the most, and using these metrics, it prioritises your emails and only shows you what's really important to you while putting low priority emails into a separate folder. Windows Hello - a biometric authentication measure the company introduced with the new desktop operating system which checks a person's face to login to the computer - also works with Office 2016. In addition, Cortana can work in conjunction with Office apps too and fetch important information and perform handy tasks.